Spice up Your website's features with these 30 Flatteriffic Vector Icons. 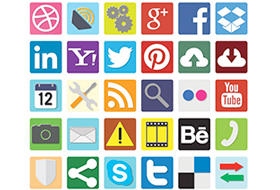 Get various categories icons like Social Media Icons, Interface icons and Many more..
Use it for personal and commercial use. This set includes all the icons we would find on most sites or projects just drop them into your projects in seconds. Interface icons, such as search, movies, email, calendar, warning, Phone, settings, tools, and transfer icons. Available in .AI and .PNG format. Ready to grab these very useful icons absolutely for FREE?